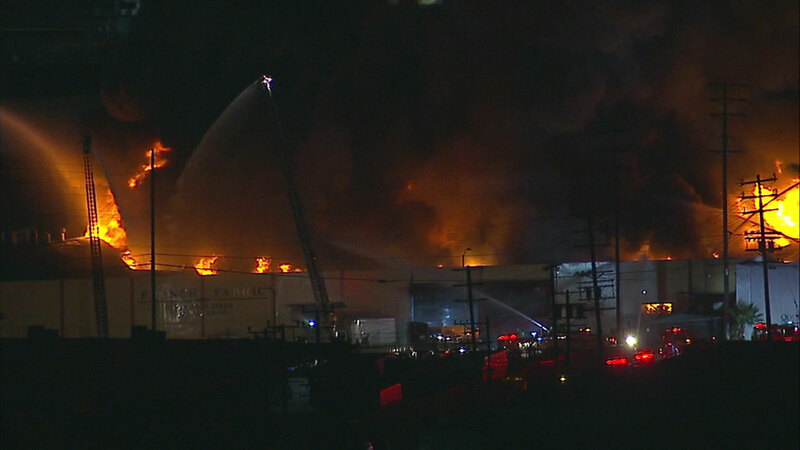 BOYLE HEIGHTS, LOS ANGELES -- A fire ripped through a single-story commercial building in Boyle Heights Saturday night. Firefighters responded to a fire in the 1500 block of South Rio Vista Avenue around 6:30 p.m. The commercial building appeared to be where fabrics were made. The fire eventually burned through the roof, sending flames high into the air and causing crews to work more aggressively because of nearby high voltage power lines. Other structures nearby were also threatened by the blaze.